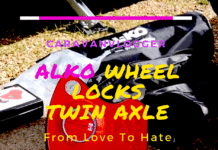 Caravanning, on the whole is a very positive experience. However, where there's caravans there are people. You can't like everyone and everyone is different and experiences their caravan adventures different. So, as they say in France "vive la difference". Pitch Parking What Are The Rules? We mainly use Caravan and Motorhome Club sites when holidaying in the UK. We’ve tried The Camping and Caravanning Club, but haven’t been overly impressed with the sites we’ve visited. Having said that we haven’t visited that many. TBH they aren’t that bad, and they let non-members on, but we don’t like their cancellation policies and their toilet blocks weren’t up to scratch at the sites we’ve visited. Anyway, the main reason we prefer CAMC are the rules. Yes, I know it sounds a bit weird, why do I want to go on holiday and comply to a load of rules, I want to relax and do what I want. I think the older I get the more I think other people need rules to behave correctly. But, I believe the rules are there to protect everyone. No ball games near the caravans, no loud music, and peace and quiet after a certain time. All good, all understandable and mostly adhered to by most people. Something I’ve noticed in recent years is the way some motorhomes park on a pitch. 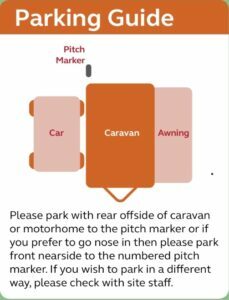 I know as a caravan owner I’m told to reverse onto the pitch with the offside by the white peg etc. Increasingly I’m seeing Motorhomes park on pitches front first, as if they were at the supermarket. Also it appears the “white peg” thing doesn’t apply to Motorhomes? What’s the big deal with that? Am I sounding like a grumpy old man? Well, that might be true, but the main problem is – privacy. I thought he whole point of reversing on a pitch was that it ensured caravans / motorhomes were not parked doors, or awnings facing each other (oh and fire safety). I’m not Motorhome bashing, we’ve had one in the past, although we now own a caravan. I can’t remember if, as a Motorhome owner you’re instructed how to park like caravanners are, but I think the white peg thing applies to MH’s as well. Our first caravan was a Knaus. Being a German van the door into the caravan was on the “other side”, so when we reversed on a pitch our door was facing the opposite caravan’s door, or awning. I hated it. We were at Grafham Waters once and asked if we could park the caravan on front ways, as the door would then be on the UK side. We were told we couldn’t as it would be a fire hazard, if a caravan catches fire, they need to tow if off. “Not whilst still in flames?”, I asked. After I served my 2 year ban… No, not really, I’m joking, they aren’t that strict! a. The maximum time you’re allowed to stay on site is 21 consecutive nights, with a 2-night gap before you can return to the same site. b. The site staff will advise you where your outfit should go in relation to the marker. If you wish to pitch in any other way please ask the site staff. c. To avoid the spread of fire, there must be at least 6 metres spacing between facing walls of adjacent caravans, motorhomes or trailer tents and a minimum clear space of 3 metres between adjoining outfits in any direction. 4.b states that staff will tell you how you should park, but you can ask about parking it in another way. So I guess it’s on a site by site basis. I personally would like to see UK vehicles reverse on and any left hand drive Motorhomes or European caravans park front first. Failing that rules should apply to everyone, all the time. No point in having a rule and then sometimes letting people park differently. We were on a site in Cornwall, we had our grandson with us so we parked near the playground, which also happened to be close to the toilet block. In fact our pitch was right in front of the toilet block. I lost count the amount of people that walked across our pitch to access the loos. People were stepping over my guy ropes for the awning. I know it’s partly the site design, but really, I don’t think I ever walk across someones pitch that close to an awning? We were sitting outside having dinner one evening and someone walked through our pitch, between us and the awning. “Good evening” he says. Bloody hell mate, fancy a burger? BTW I don’t mind people walking in between pitches. I don’t own the grass my caravan is on, but there’s ways of doing it and having to step over the guy ropes is to close. Most people adhere to site speed limits. It is difficult sometimes to drive at 5MPH, you’re in a hurry, you’ve seen a pitch you like. But really, you should observe the speed limits, especially when children are around on bikes and scooters. 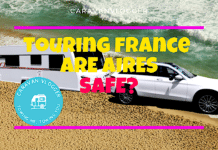 Something that occurs more and more is the passenger of a car / motorhome getting out and whilst the driver checks in and pays they run on site and select a pitch. When they get there they stand in it, waiting for the caravan / motorhome to arrive and park there. I’ve even recently seen a car park in an empty pitch (in fact one that was vacated next to me) and get out of the car and almost run away. I thought this was a bit odd. The car was parked there for about 30 minutes. Caravans and Motorhomes were going round and round on site looking for an empty pitch. Then low and behold the same guy that parked the car rolls up in a Motorhome, parks it next to the car and set up. I’m not over keen on confrontation so I didn’t say anything, I might have given him daggers.. If we think we’re going to arrive at a site early, we generally pull over somewhere and wait. Then we arrive on site at say, 12:00 or whatever the time is. However, I do see a lot of people turn up early and be let in, which is frustrating. I guess there’s an issue on some sites and they can’t have caravans queueing outside until opening time, but, rules are rules…Aren’t they? As I mentioned in the introduction we had someone flying a drone next to our caravan. Now, I love drones and would dearly like one, I think the footage from them is amazing. However, wouldn’t most people ask for permission first? I know some sites don’t allow it, which is something you have to respect. I know A LOT of people like flags. I know this because I see them on site. But I’m not sure why people have them? Of course, a flag has caused me an issue on site – I mean what hasn’t! The flag was so big and it was so windy that we could hear it flicking in the wind all night. 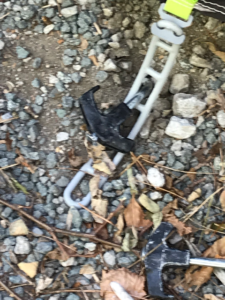 I assume people use them so that the kids can find the caravan when coming back from the playground.. Camper vans. There seems to be a theme occurring here. I say I really like something them moan about it. So, I love camper vans, especially VWs. (Here comes the moan. Wasn’t that a song by The Beatles?) But really do they have to slam the door at 5AM! I can only assume they’re going for a wee. Not all hardstanding pitches, but just the ones where you can’t actually get the pegs in. You might have read elsewhere on this site about my experience with the hard pitches in Brighton. I bent at least 5 hard standing pegs. I mean why do they need to be that hard? It was like banding them into concrete! My wife would probably say I moan a bit, but when you do all the setting up and try to get it right it also annoys me when people disregard the advice. We are touring long term so move sites every couple of week. We go where we fancy and use both Caravan & Motorhome Club and Camping and Caravanning Club sites. We have found both to be of equal standard. We prefer the smaller privately owned CL or CS’ where possible gor peace and privacy. My main gripe is the same as yours, people tramping over your pitch. Perhaps this should be put on the site information leaflets. It’s is possible the other half moans about these things more than I do. She would probably “take action” i.e. confront people, but that’s not really my thing. I think we need to try more CL’s and CS’s. We’re a bit torn between wanting peace and wanting good facilities. 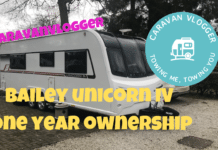 I think the real answer for us is to start using the caravan’s shower more..
We sold our caravan last August but are really missing our frequent couple of nights away…. we are now looking for another. Main issues for us are children playing in and out of pitch areas completely unsupervised. 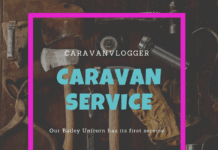 Now I work with children and really enjoy seeing them play and have a great time, but I would never have let my own play around other peoples caravans and would ensure they played in the designated areas. I now choose sites with hedges etc dividing the pitches. And I’m sorry, but what are the flags all about???? 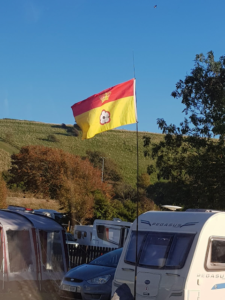 I would be a bit worried about letting kids off to play if their way of recognising their own caravan was a flag – particularly when it’s a Union Jack (usually a fair selection of them….). Hope you find a new caravan soon !